As any athlete knows, some race days are filled with glory, while others are not nearly as satisfying. Professional triathlete Carrie Lester has served up many successful races over her budding career, even on the grandest of stages with her epic win at the Embrunman, the toughest Iron distance race in the world. Lester also knows what it’s like to have her race day take a turn for the worse. It’s how she bounces back from disappointment, that is what has helped her excel. Find out how our Aussie XRCEL ambassador rebounded from the Ironman World Championships and added more outstanding finishes to her dazzling racing year. 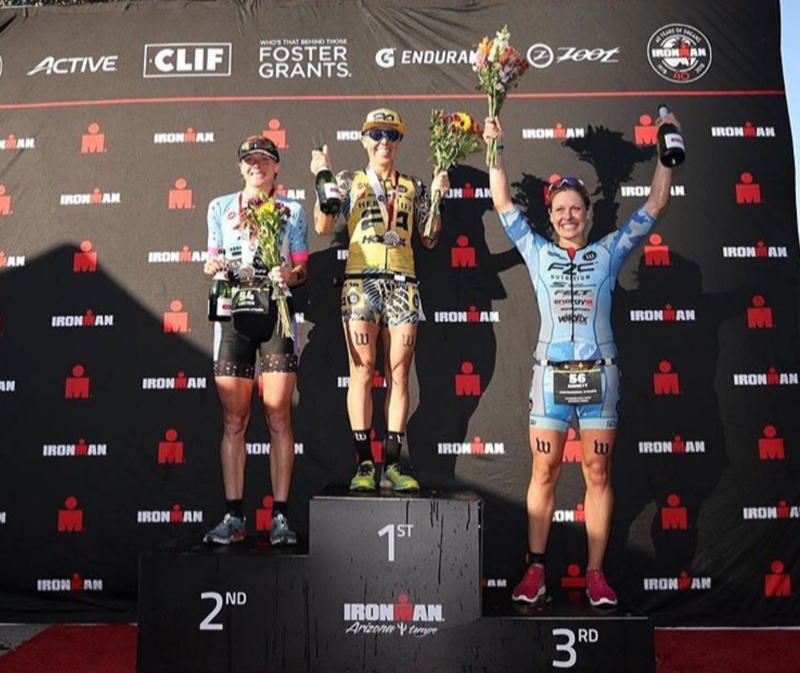 XRCEL: Leading into Kona, you had some great races. How were you feeling mentally and physically going into the World Championships? Carrie Lester: This was my third year racing professionally in Kona and I felt like I was in the best shape. My race performances and training over the summer gave me a lot of confidence leading into the race and I was ready to take on race day with a strong performance. How specifically did your race in Hawaii go from start to finish? The swim for me didn’t go as well as I would have liked, but I held my own. I set off on the bike and within the first 30 minutes, starting throwing up liquids, a mix of the salt water and any gels and fluids I had consumed straight out of the swim. This kept happening for the first hour or so, and then it seemed to settle enough for me to get in some nutrition. By halfway, I was starting to feel better, so I began to push along riding up to as high as fifth place, but then about 30 minutes before the end of the bike, I started getting sick again. Every step of the run, until I had to stop, was a blur. It was very disappointing as it was something completely out of my control. I can only blame it on the water as it was very dirty from the rain run-off and I swallowed too much during the swim. When did you decide to DNF in Hawaii and what was going through your mind in those moments when you knew your day was over? At about mile eight of the run, I decided that was enough. It’s always a hard decision to make, especially at a World Championship, whether to push on or call it a day. Unfortunately, only the top 10 get paid in Kona, so when your day is going really badly, you have to make a “business” decision.” The options are to keep going and do more damage and jeopardize your recovery, or stop, recover faster, and race again. What did Scott, your coach, say after Kona and how did you guys regroup for the rest of your racing year? We made a new plan almost the day after Kona as to how we would handle the rest of the year. We took a few days after Kona because I still needed some recovery time and then we started back into training for the end of season races. How did the DNF in Kona play a part in your 2nd place finish in Mexico (IRONMAN 70.3 Los Cabos)? My goals really were to attack the swim and bike and then give it anything I had left on the run. I wasn’t angry about Kona, maybe still somewhat disappointed, but I really wanted to just put out a strong performance I knew I was capable of. Secretly, I wanted to qualify for the Ironman 70.3 World Championships in Nice next year and I did that unexpectedly, so it took some of the Kona disappointment away. I can’t wait to race in Nice next year! Heading into IRONMAN Arizona just 2 weeks later, what were your goals and how did you and Scott prepare for your first IM after Kona? Preparation was no different. Looking at the start list, my goal was to swim with Meredith Kessler, put down a solid bike split, and run a 3 hour to 3:05 marathon. That was my perfect day. I nailed the first two, but my marathon time was 3:07 (2 min. slower than my goal). It was still one of my fastest IM’s to date, so again, it gave me a lot of confidence. During Ironman Arizona, how did you handle your race day nutrition? It was a little cooler in the morning and temperatures over the day were pretty mild, so the only thing I really changed was I had a little less sodium. I used XRCEL as my gel source throughout the whole day consuming nine bottles from start to finish. What were you feeling when you finished in 2nd in Arizona and what did you learn about yourself that day, after a tough day in Kona? I had complete confidence in myself and my training and I was so proud of how I didn’t let that one race define my year. I can’t even think about my 2019 racing plans yet, but I imagine it will be similar to this past year. What is it about training and racing with XRCEL that you like the most? I like it because I never get sick of the taste, I can have it at any time of the day, and it never gives me GI issues. I have a sensitive stomach, which is worse under the stress of racing and training. XRCEL is the best product to help fuel me during these times because it’s so easy to digest. I also don’t get the highs and lows that I would get from other gel products since XRCEL is an extended release gel, so energy is delivered at a steadier rate so I don’t ever feel like I am “bonking”. How has racing and training shaped who you are as a person, outside of triathlon? Triathlon is a special sport. I am an active person and I will always be active. Racing and training has provided me with goals, routine, structure, discipline, self-motivation, self-determination, and so much more. It has also introduced me to so many parts of the world where I have met lifelong friends and created relationships that have helped me mature in both my sporting and personal life. Knowing a career in triathlon has a shelf life, what do you see yourself doing after your triathlon career is over? I can’t fully answer that yet. I would like to be more of an “on deck” coach for our coaching business, KIS Coaching. I also have a few side interests I may want to pursue. What is the best advice you could give to another triathlete, knowing the sport has its many highs and lows? Take the time to reflect, acknowledge any mistakes, acknowledge what went well, make a new plan and move on. There are races all over the world, so pick yourself up and try again. What does your training currently look like now that it’s the end of the year? I just raced my final race of the year, Indian Wells 70.3, and finished third. We will now have a break from structured training over the holidays so I can enjoy time with family & friends. We also have a list of house projects to keep us busy along with some surfing.